In the Auction of IPL 2019, we have seen many surprises. All franchises have strengthened up themselves after buying the players. So now they have enough playing and we will see players playing out of them only in IPL 2019. 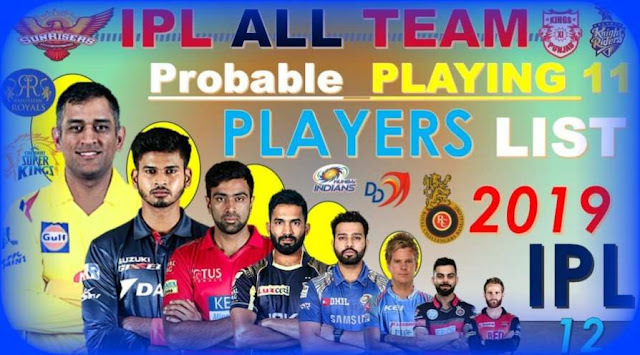 So you must be wondering, what would be the most suitable IPL Probable 11 for all teams and which IPL Probable 11 is better what can be the IPL Probable 11 of all teams? Here I have analyzed all team's IPL Probable 11. So check below the complete list of IPL Probable 11. Mumbai Indians has a total squad of 24 players in the team for IPL 2019 after the Auction. MI has total 16 Indian players and 8 Overseas players in their squad. MI has 8 Uncapped players in their team for IPL 2019. So some of these players will be on the list of Mumbai Indians IPL probable 11. So here I am going to tell you the names of the IPL probable 11 players of Mumbai Indians who are in the primary list of MI for IPL 2019. ▶ Openers: For sure Rohit Sharma will be playing as an opener from one side, We will see South African Opener Quinton de Kock with him opening the inning. There is no doubt in that. ▶ Middle order: Middle order is going to play a most important role. In the middle order, we will see Evan Lewis. Ishan Kishan will be coming of number 4 and on number 5 we will see Yuvraj Singh. Though MI has a lot of options for the middle order, but these three are the primary IPL Probable 11 of Mumbai Indians. If some of them fail to perform then Mumbai Indians can give a chance to other options like Suryakumar Yadav, Aditya Tare. All-rounders: Mumbai Indians has a strong set up of all-rounders. I think the most probable all-rounders of Mumbai Indians in IPL 2019 should be Pandya brothers and I'm sure they will be. So this is the plus point for Mumbai Indians that they don't need overseas all-rounders like other teams. Ben Cutting and Kieron Pollard can be used as backup all-rounders. Bowlers: Talking about bowlers, Mumbai Indians seems to be very strong. Mumbai can come with 3 pacers, 1 spinner, and 2 all-rounders. Even after buying only 2 players from the Auction of IPL 2019, M.S.Dhoni has formed a strong and balanced squad of 25 players for Chennai Super Kings. Here I am going to tell you the IPL Probable 11 players of Chennai Super Kings who will be playing in IPL 2019. ▶ Openers: This is for sure that Shane Watson and Ambati Rayudu will be the opening the innings of Chennai Super Kings as they did last year. ▶ Middle Order: In the middle order Suresh will come at 3 and for the number 4 and 5 there are Kedar Jadhav and M.S. Dhoni. Dhoni and Jadhav can switch their spots sometimes. CSK have Faf du Plessis, Sam Billings, and Murli Vijay as backup players in the top and middle orders. All-rounders: If we talk about the lower order of Chennai Super King, they have two of the best all-rounders in the IPL. These two will be playing 11 of CSK in IPL 2019. Bowlers: Bowlers play the most important role in T20 games. So if we take a look at CSK's bowler's list, we will find a balanced list. CSK bought Mohit Sharma this year for 5 cr. Except this IPL probable 11, CSK has a strong back also and they turn out to be a strong contender. After buying 8 players from the Auction of IPL 2019, KKR has made a strong squad of 21 players for IPL 2019. So here today we will check the KKR's IPL Probable 11 in 2019. ▶ Openers: Sunil Narin and Chris Lynn are the two openers for KKR in IPL2019. These two have already been playing as openers for the last two seasons. If these two fail then KKR has Shubman Gill as a backup who can come to the opening from the middle order. ▶ Middle order: Number 3rd, 4th, and 5th is a very important spot for KKR. Andre Russell is the backbone of the team KKR and if he fails or gets injured, Carlos Braithwaite will be given chance in the team. ▶ Lower Order: The lower order is also most important for any team. Bowlers: KKR has 4 top class bowlers which are given below. They don't have any backup player for Kuldeep Yadav. Read Full list of Top unsold players, Why did McCullum go unsold? Royal Challengers Bangalore has total 24 players after Auction of IPL 2019. They have retained 15 players and bought 9 players from the Auction, so now they have a complete squad of 24 players. So here let's talk about the IPL Probable 11 of RCB in 2019. ▶ Openers: The Opening pair of RCB will be changing this year. After being successful in 2016, Once again we will see Virat Kohli playing as an opener and with him, we will see Parthiv Patel. ▶ Middle Orders: Middle-order of any team matters a lot when we talk about IPL, so for number 3rd RCB has their current buyer Shimron Hetmyer. Ab de Villiers will be coming on number 4 and after him, Shivam Dubey will enter. ▶ Lower Order: Lower order has a lot of all-rounder in RCB but here I am telling you the most probable all-rounders in playing 11 of RCB in IPL 2019. All-rounders: They have traded Marcus Stoinis from KXIP this year so Stoinis will be surely in IPL Probable 11 of RCB. Bowlers: Finally take a look on the bowling side of RCB which used to be a weak point for RCB. ▶ Openers: Firstly talking about the openers of KXIP in IPL 2019, no doubt that Chris Gayle and KL Rahul will open the innings. ▶ Middle Orders: Some changes are possible in KXIP squad's middle order. Recently bought Nicolas Pooran will surely be in the playing 11. ▶ Lower Order: The lower order mainly all-rounders spot of KXIP was very weak last year. So they gave attention this year on that spot. All-rounders: The most surprising bidding was done by KXIP in IPL 2019 when they bought Varun Chakravarthy. as the most expensive players of IPL 2019. Bowlers: The most probable bowlers of KXIP in IPL 2019 are given below. Sunrisers Hyderabad seems a very balanced squad of 23 players after the IPL 2019 Auction. So let's take a look on the IPL Probable 11 of SRH in 2019. ▶ Openers: There is no doubt that W. Saha and David Warner will open the innings of SRH. SRH has already traded Shikhar Dhawan so he will not be playing for SRH. ▶ Middle Orders: SRH has a strong middle order for IPL 2019. Bowlers: Bowling has been a core strength for SRH so far and it still looks promising. Rajasthan Royals which was looking weaker before the IPL 2019 Auction. After buying some valuable players, Rajasthan Royals have strengthened themselves up. So let's take a look at IPL Probable 11 of Rajasthan Royals in 2019. ▶ Openers: There are not many options are available for openers in Rajasthan Royals Team. Rahane and Rahul Tripathi are most probable openers in IPL 2019. ▶ Middle Orders: Middle orders may not be the same. All-rounders: Rajasthan Royals have very good all-rounders but due to 4FP Rule they can't play. Any IPL team can't take More the 4 foreign players in playing 11. Bowlers: Rajasthan has a strong bowling line up and that will benefit them most in this season. Delhi Capital was very imbalanced before IPL Auction 2019 but after Auction, they have a strong squad of 24 players. So here check the IPL Probable 11 of Rajasthan Royals in IPL 2019. ▶ Openers: As we already know that Delhi Capitals have traded Shikhar Dhawan from SRH. So this a good news for Delhi fans. ▶ Middle Orders: The middle order is the strongest factor of Delhi Capitals. All-rounders: Delhi is very well balanced in this case now in this season. Bowlers: Talking about the bowling side of Delhi Capitals we see, the pace department is very strong. So that was the whole list of IPL Probable 11 of all teams who will be playing IPL 2019. This is the most possible list of IPL 2019 Playing XI of all Teams. So, if You have your own playing 11 in mind then tell me in the comments.